426 pages | 12 Color Illus. | 53 B/W Illus. "A comprehensive repository of all aspects of scientific cane management based on the practical experience and knowledge of the authors. It encompasses chapters on agro-techniques, irrigation management, nutrition, ratoon management, mechanization, molecular approaches for sugarcane genetic improvement, crop protection, sugarcane maturity, and postharvest management. 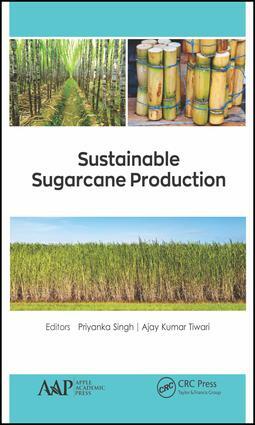 The book also highlights issues related to environmental protection by the sugarcane industry. Will be extremely useful to all stakeholders connected with the sugarcane and sugar industry." "Includes almost all the aspects of sustainable sugarcane cultivation, development, and management. This book will surely be an excellent contribution in the area of on sugarcane cultivation. The chapter on farming technologies for sugarcane production, by Dr. Yang Rui Li, gives a comprehensive account of simple and easily operated scientific agronomic practices for sugarcane cultivation in today’s changing climatic conditions. The section on sustainability issues for sugarcane production and the possible measures given by Dr. Vlontzos is also very impressive. The chapters of Dr. Srivastava and Dr. Chandra cover recent molecular approaches including the transgenic and molecular marker for sugarcane genetic improvement, which is the need of the hour, and it also gives a better understanding of the source-sink relationship and its modulation to get the maximum potential of the sink by improving sugar accumulation and sugar yield in sugarcane. The chapter on residue uses by Dr. Rosetto will be quite useful in today’s perspective when the major concern is environment and enhancing the income of farmer including proper utilization of the by-products. The book also includes sugarcane cultivation in abiotic stress conditions, and it gives the broad spectrum of major pests and diseases in sugarcane and their possible control measures, which will be of tremendous importance for sustaining the productivity of the released varieties for commercial cultivation. New and promising biological control of the borers are the need of the hour in sugarcane, and the book also deals with this topic, which will be of utmost importance in coming days. Further it covers important areas like ratoon management and mechanized farming of sugarcane, which gives a very clear picture on increasing the production through cost efficiency and timeliness of cultural operations, thereby achieving sustainability in sugarcane farming. The chapter of Dr. Shanthy explains in detail the importance and means of transfer of technologies, the communication channels that can be utilized in sugarcane and in the sugar sector, and the development of sugarcane in a holistic sense in the years to come, which requires mix up of innovative extension approach with technological interventions appropriate for a given situation." Priyanka Singh, PhD, is the Scientific Officer of the Uttar Pradesh Council of Sugarcane Research (UPCSR), Shahjahanpur, India. She has worked at the Indian Institute of Sugarcane Research, Lucknow, India for nine years. She has 19 years of research experience with a specialization in organophosphorus chemistry and in the area of cane quality/postharvest management of sugar losses with the help of chemicals as well as eco-friendly compounds. She has extensive experience using electrolyzed water to preserve cane quality, and is responsible for the first time that it was reported that electrolyzed water has immense potential to be used in sugar industry to preserve post harvest sucrose losses. She has synthesized and characterized 37 new organophosphorus compounds belonging to the chalcone series, of which two important chemicals (Chalcone thiosemicarbazone and Chalcone dithiocarbazate) were found to be highly fungitoxic to the sugarcane parasitic fungi Colletotricum falcatum, Fusarium oxysporum, and Curvularia pallescene. She has worked on the extraction of volatile constituents from higher plants and their biological activity against agricultural pests. She also worked on the management of postharvest formation of nonsugar and polysaccharide compounds in sugarcane and the effect of bioproducts on growth, yield, and quality of sugarcane and soil health. She has also worked on indicators of postharvest losses in sugarcane and reported that Mannitol is one of the most important indicators. Presently she is working on varietal spectrum of sugarcane for the selection of elite sugarcane varieties so as to recommend the proper varietal balance of sugarcane varieties in Uttar Pradesh, as well as working on modulating the activities of sucrose metabolizing enzymes through bio-active silicon (orthosilicic acid) for increased cane and sugar productivity, which will benefit farmers as well as the sugar industry in remarkable way. She is also managing and working on a project on "Assessment of postharvest quality deterioration in promising sugarcane varieties under sub-tropical condition," which is expected to reduce postharvest losses and will increase sugar recovery. She is carrying a project on "Varietal screening for jaggery" production at UPCSR, Shahjahanpur, for the recommendation of elite sugarcane varieties for commercial production of jaggery. Dr. Singh is a research advisor for a dissertation on genetic diversity in sugarcane and a training advisor for MSc students. She has organized several short-term training programs on techniques in microbiology, biotechnology, and molecular biology. She received an "Award of Excellence" from Sinai University, Al Arish, Egypt, in 2008. She is also serving as Managing Editor for the journal Sugar Tech and as Executive Editor for journal Agarica. In addition, she is a reviewer for several international journals. She is one of the editors of the Proceeding of International Conference IS-2011. A prolific author, Dr. Singh has written a book on innovative healthy recipes with jaggery, edited three books on postharvest management of sugarcane, written several annual reports, written on 100 years of sugarcane research, and published three book chapters and more than 50 research papers in various national and international journals and proceedings. She has attended several and international conferences and workshops in China, Egypt, Thailand, and India, and has coordinated technical as well as plenary sessions in India, China and Egypt. Dr. Singh completed her PhD on "Efficacy of organophophorus derivatives against fungal pathogens of sugarcane" in 2000 from DDU, Gorakhpur University, Uttar Pradesh, India. She was awarded a postdoctoral fellowship from DST, New Delhi, in 2006 and 2010. Ajay Kumar Tiwari, PhD, is a Scientific Officer at the Uttar Pradesh Council of Sugarcane Research (UPCSR), Shahjahnapur, India. He is a regular member of the British Society of Plant Pathology, Indian Phytopathological Society, Sugarcane Technologists Association of India, International Society of Sugarcane Technologists, Society of Sugarcane Research and Promotion, Prof H. S. Srivastava Foundation, and Society of Plant Research. He has published 75 research articles and 12 review articles in national and international journals. He has also published six book chapters in edited books and has also authored seven edited books. He has submitted more than 150 nucleotide sequences of plant pathogens to Genbank. Dr. Tiwari is a regular reviewer and member of the editorial board for many international journals. He has been awarded the Young Researcher Award in Italy 2011, the Young Scientist Award by DST-SERB, and was nominated for the Narshiman Award by the Indian Phytopathological Society. Very recently he was awarded the Young Scientist Award by the Chief Minister of the State Government of Uttar Pradesh for his outstanding contribution in the area of plant pathology. Dr. Tiwari is the recipient of many international travel awards given by DST, DBT, and CSIR from India, PATHOLUX from Luxembourg, and IOM from Brazil. He has visited China, Italy, Germany, and Thailand for conferences and workshops. He has been involved in research on molecular characterization and management of agricultural plant pathogens for the last nine years. Currently he is working on molecular characterization of sugarcane phytoplasma and their secondary spread in nature. Dr. Singh earned his PhD in 2011 on Cucurbit viruses from the Biotechnology Department of CCS University, Meerut, UP, India.